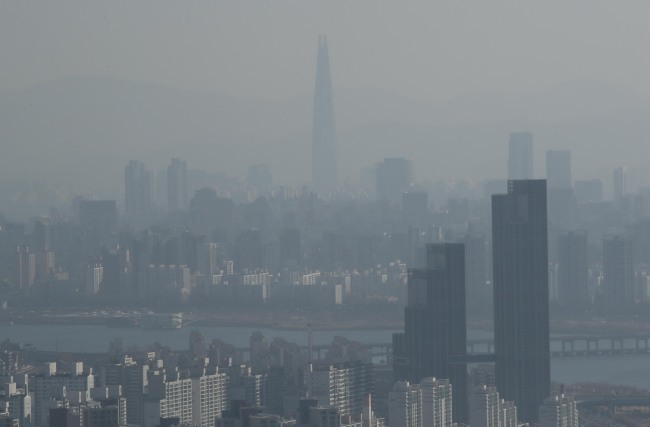 South Korea's industry ministry on Monday claimed that the worsening fine dust concentration in the country's air cannot be attributed to the government's nuclear-free policy, claiming Seoul has steadily made efforts to reduce coal-based power generation. The Ministry of Trade, Industry and Energy claimed that it is wrong to conclude that the density of fine dust increased because the country operated more coal power stations to meet demand for electricity amid South Korea's efforts to move break away from nuclear power plants. "Since the launch of the Moon Jae-in administration, the amount of fine dust created from coal power stations has been falling," the ministry said, claiming local nuclear plants have recently generated less power due to other factors, and not the government's energy policy. The ministry said while the amount of power produced from coal power stations increased 25 terawatt hours in 2017 from a year earlier, this is due to the operation of more efficient power plants that were launched under previous administrations. The amount of fine dust produced from coal stations, on the other hand, reached 26,952 tons in 2017, down from 30,679 tons produced in 2016. The figure for 2018 is estimated at 22,869 tons, the ministry said. South Korea suspended operation of five old power stations from March to June of 2018, and plans to spend 11.5 trillion won ($10 billion) through 2030 to improve environment-related facilities of coal plants. In terms of nuclear energy, local plants generated less power recently due to maintenance and factors other than Moon's energy policy, the ministry added. "Liquefied natural gas-based power has replaced most of the decrease in nuclear power generation," the ministry said, claiming that less nuclear power does not mean more coal-based generation. "The proportion of nuclear power will increase again once plants under repair start operation." When the construction of five nuclear plants under progress is completed, the ministry said the amount of power generated by nuclear will increase again, claiming the government's energy policy is a long-term endeavor. To cope with fine dust, the government said construction of new coal plants will be banned, although those under construction will be completed as planned. "Considering legal issues, regional situations, and employment, the constructions of seven stations of nine approved by the previous administrations are being pushed forward," the ministry added. It also said 10 coal power stations which have been operating for 30 years and more will be shut down by 2022, which is earlier than the original plan of 2025. The ministry did not provide comments on the alleged influx of find dust from China giving adverse impact on the local environment. An official said coal-based power generation accounts for roughly 15 percent of the country's fine dust concentration. "Fine dust created from coal power plants has been continuously decreasing. Although the amount may not meet public demand, the government will continue to make efforts to reduce it this year,"